Dynolite Gear Oil 40 is a 25w-70 multigrade gear oil that replaces oils originally specified as EP90, SAE40. 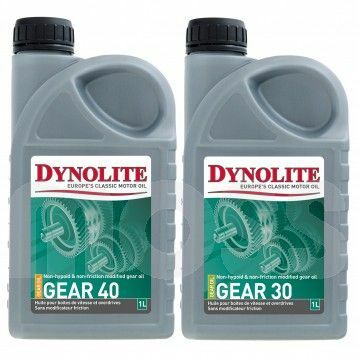 It is a non-hypoid and non-friction modified high quality multigrade gear oil for use in synchromesh and straight cut gearboxes. Formulated without EP additives making it safe for use with bronze, copper and brass components and without friction modifiers making it safe for overdrive and preselector units. Guaranteed non-recycled base oils. Avoid contact with skin or eyes. Wear protective clothing. Dispose of waste product and container correctly.